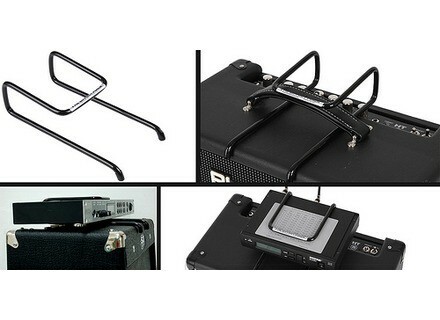 The Effect Rack, Stand & Rack from Deeleebob Music. Deeleebob announced the release of The Effect Rack developed to hold a rack mount device, hold an audio interface, iPad, Smart tablets, sound module, DI box, wireless system, or anything else that is used with an amplifier. The bracket device is designed to allow for carriage and access to a variety of devices normally placed hap-hazard on top, or beside an amplifier. The Effect Rack uses a friction clamping action to hold in place a 1U or Half rack space device, iPad, wireless receiver, DI box, Speaker emulator, custom pedal board, and other similar sized music gear. Alternative to buying a full rack system. 1U space device or half rack unit. Works with iPad or similar smart tablet device. Designed not to scratch or mark equipment. Poly coated stainless steel construction. Holds an effect unit or other device on top of the amp. No drilling or additions to the amplifier. Vibration and shock will not affect The Effect Rack. Uses the existing amp handle and friction to hold your gear. Fits inside a soft case with an effect unit. 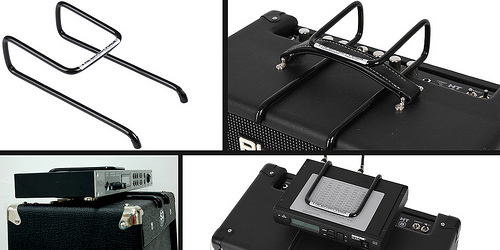 Designed to work with any amp that has a handle on top. U.S and International Patents Pending, Euro Patent App. #2 339 865. Elastick mini iPad Stand on Kickstarter Elastick mini is a musician's iPad holder product designed to clip the tablet to a mic clip on a stand. Rotosound Launches Cooperstand in the UK Rotosound announces the release and distribution of Cooperstand guitar stands in the UK.